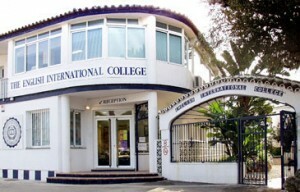 The English International College, founded in 1982, is a non-profit making, co-educational day school. It is essentially an English college situated in an international environment. The school is administered by a Director (answerable to the Trust) and follows a British curriculum, which offers a rounded education to students aged 3-18, who generally represent around 25 nations. Highly qualified teachers, mostly from the United Kingdom, work with small classes and the very favourable teacher : student ratio enables a high degree of individual attention in all aspects of academic and pastoral life. There are four research standard Science Laboratories, three Computer Suites (150 desktops), an Art studio, a multi-purpose Hall/Theatre, and a Music and Drama room. In addition, the latest generation of interactive whiteboards are incorporated in every classroom. A full time librarian runs the well-stocked and resourced Primary and Secondary purpose built library (12,000 books). 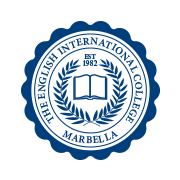 A The EIC is situated in a spacious campus located to the east of Marbella, on the main road CN340 (A7) . The classrooms are arranged around a beautiful central garden, incorporating two swimming pools, a sports field with additional volleyball and basketball courts. Sports are timetabled for all students, enabling them to enjoy these, and the school’s many other facilities, on a regular basis. school restaurant serves meals and refreshments to both students and parents. School coaches collect students from as far as Torremolinos in the east and Estepona in the west. Throughout the school, starting with the youngest children in the “Early Years” group, the curriculum closely follows the National Curriculum in the United Kingdom, extended to encompass the multi-lingual requirements of an international school. At the upper end of the Secondary Department, students prepare for the International General Certificate of Secondary Education and the academically rigorous Advanced Level examinations as well as Spanish LOGSE, choosing from a wide range of subjects on offer – Art, Biology, Chemistry, Physics, Mathematics, Information Technology/Computer Studies, Economics, Business Studies, Drama, English Language and Literature, both First and Foreign language Spanish, Foreign Languages (particularly French and German), Geography and History. English as a Foreign Language courses are also available for those students requiring tuition in this area. The School also offers the Duke of Edinburgh Award Scheme, and holds three gold awards. For non British students there are courses leading to the Cambridge Preliminary English Test, and First Certificate and Proficiency examinations. All examination results have been consistently outstanding and the College is well-known for the high percentage of its students who go on to some of the best universities in the United Kingdom (including Oxbridge), Spain, the rest of Europe and the United States. Extra-curricular activities are offered during the school day as well as after school in order to broaden the general education of pupils and enable them to develop their interests in many areas outside the academic curriculum. Fencing, Karate, Drama, Instrumental tuition, Dance, Swimming and Football (and other sports) are just some of the options available. Regular inter-school sports tournaments and Drama productions also add an important dimension to the life of the school, and a very supportive and active PTA organises many social and fund-raising functions. The college also offers a popular summer activity school during July each year.